Quote from project staff in our research project. This section will help you to develop an understanding of the nature and causes of primary and secondary stress and consider some strategies for reducing stress and improving overall well-being. Many frontline staff within the homeless sector experience high levels of stress due to the numerous and complex challenges they face when supporting clients. For instance, working with clients with high support needs, chronic substance use issues, advancing poor health, and limited options for moving on. Many staff go above and beyond the remit of their roles to provide care and support, often doing things that fall outside the scope of their skills and expertise. This can come at a high emotional cost. If gone unchecked, it can lead to burnout. As many clients also have lifetime experiences of loss and trauma, frontline staff may also be at risk of experiencing secondary trauma, or compassion fatigue as they listen to and reflect on the stories clients share with them. How stress is managed may depend on systems in the workplace that support staff wellbeing, safety, and training needs. It involves ensuring the demands imposed on staff do not exceed their level of skill and expertise. It also requires staff to recognise and attend to their own experiences of stress, particularly if stress becomes unmanageable. This may involve considering alternative ways of coping with stress that could be more beneficial. Finding the best ways to manage stress gives everyone a greater chance of being able to continue working in their roles with enthusiasm, optimism and compassion. Recognising early warning signs can help you manage feelings of stress at work.The Self-care toolkit could help you devise a self-care plan. Doing so may help you manage difficult situations and prevent stress levels escalating, reducing the risk of burnout. Be kind to yourself, and be realistic. It may take time to establish new coping strategies or introduce new nourishing activities. Some people may find it particularly difficult to support someone in the last months of life. Ideally, flexibility in planning care and support in a project needs to incorporate the views of everyone involved, and help staff to support each other. Further information and tools can be found in the tools and resources section, including this on-line course. We all have limitations, expectations and things we would like to change about ourselves and the world. In working with clients it’s important to remember that we are not responsible for ‘saving’ them or keeping them alive. While we bring an intention to support others, it’s important not to forget to care for ourselves. We all experience stress differently, even if exposed to the same stressful event or situation as others. Further reading material and resources. Burnout – a state of emotional, mental, and physical exhaustion caused by excessive and prolonged stress. It occurs when you feel overwhelmed, emotionally drained, and unable to meet constant demands. The situations and pressures that cause stress are known as stressors. They include anything that puts high demands on us, so includes positive events as well, such as getting married, or getting a promotion. There are two levels of stressors – primary and secondary. Primary stressors are the events that arise simply as a part of being human, and from the world we live in. Stress reactions are our initial responses to certain situations or events. They include physical and emotional responses, such as shock or numbness, sadness, happiness, worry, and disappointment. For example, reactions could include the initial disappointment we feel when a friend lets us down, or sadness when a client dies, or worry we might hold that a client with advanced ill health is going to die. With primary stressors there are two forms: external (our environment); and internal (our initial responses to the stressor, i.e. our thoughts and emotions). Together, they can affect all aspects of our lives. Work – e.g. demands and deadlines, shift patterns, working with clients with high support needs, and working with limited services. Relationships – e.g. family responsibilities, separation and loss, expectations of work colleagues and clients. Sustenance and safety – e.g. our basic need for food and shelter. Money – g. not having enough (being in debt), having too much, (worried about losing it). Our ageing and dying – e.g. getting older, becoming ill and the dying process (how it might be). Time – e.g. not enough time (time pressure), too much time (restlessness or boredom). Digital age – e.g. social media, mobile phones, emails. Secondary stressors are the additional stress responses we bring to a stressful situation or event. They are often the main cause of our stress, (e.g. feeling angry, or fearful, or self-critical). For instance, following the initial disappointment from having been let down by a friend, a feeling of resentment or anger might arise, perhaps as we remember similar events or situations in our lives with others, or the initial worry that a client is going to die may lead to feeling anxious if we believe we have failed them in some way. They are internal, (mainly through our thinking), and largely unconscious, meaning we are not always aware of them until something alerts us, such as a body sensation like tension or an ache, or noticing we are angry, or short tempered. They are also influenced by what else might be going on at the time – e.g. our mood, or perhaps recent changes in our lives, (e.g. increased demands or responsibilities at work or home, relationship difficulties, bereavement). They arise from such things as negative self-talk, (‘I’m no good at my job’), having unrealistic expectations or demands of ourselves and others, chronic worry about things that may or may not happen, rigid thinking – (lack of flexibility), or an all-or-nothing attitude. On their own, these additional reactions are unlikely to cause any medium or long-term effects, and the body can recover quickly. However, if we are repeatedly exposed to the same stressor, or many different stressors for an extended period of time they can become ever present in our lives, and will eventually push us to dangerous levels of stress. While we may not always be able to change or control certain situations or events, (i.e. a client choosing not to engage with services), or what others may say or do, we can change the way we ordinarily react to them. We can also recognise what compounds our stress, (e.g. over eating, over working, negative self-talk), and consider what is more helpful to us (e.g. nourishing activities, connecting with others). One of the first steps towards good stress management is to recognize the warning signs and symptoms that indicate we are feeling stressed, or are about to be stressed. The more signs and symptoms you notice in yourself, the closer you may be to stress overload. 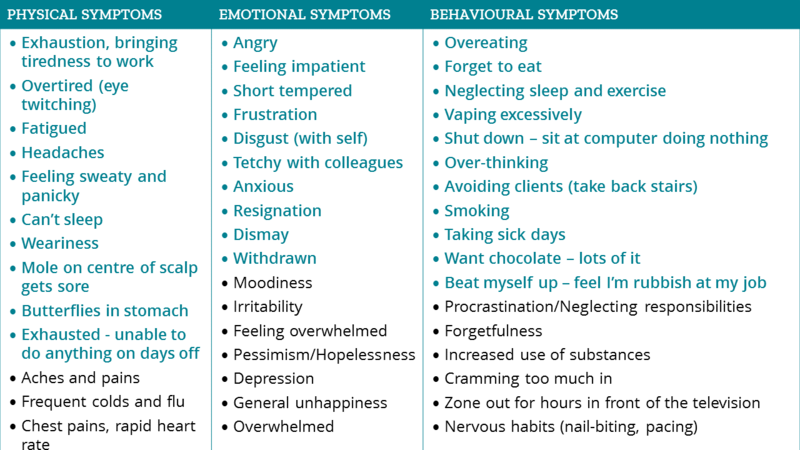 Could recognising the signs and symptoms and behaviours resulting from stress enable you to respond differently? How might we get from feeling worried about a client to feeling overwhelmed or anxious? As secondary stressors mainly arise through our thinking, noticing the potential they have to lead us from say an initial worry or concern about a client to much stronger emotional and physical reactions, (like feeling anxious, or angry), allows us to understand more about how overtime we can arrive at these stronger reactions, and consider alternative ways of responding. The worked examples below aim to illustrate how these charged reactions can arise, especially if repeatedly exposed to the same or similar events or situations over time. The following strategies for managing stress, may help you explore alternative ways of responding to life events. This may help to minimise stress you may be experiencing at work, or in your life generally. The tools below can help you find strategies for coping with or reducing stress in your life, particularly if (or when) you are close to stress overload. To understand more about how we arrive at our own emotionally charged reactions, i.e. feeling overwhelmed, or angry or anxious, the stress reactivity tool may be helpful. It provides an opportunity to explore your own familiarly charged reactions, to be curious about what’s behind them, and to help you consider alternative ways of responding to stressors you face at work, and in your life generally. Use the stress reactivity worked examples that accompany the tool as a guide to working with situations and events where these kinds of emotionally charged reactions occur. Remember, an emotionally charged reaction by itself may be manageable, but if particular reactions repeatedly occur overtime, it’s important to know more about them. In that way we can begin to make more informed choices about how to respond differently. You can access the stress reactivity tool here. Self-care is any activity we engage in on a regular basis to minimise stress, and maintain physical, mental and emotional wellbeing. Its aim is to help us to take care of our physical and psychological health, and achieve equilibrium across our personal and work lives. Activities include, physical exercise, relaxation techniques, eating well, or connecting with people we like. It can also include techniques and practices, such as taking regular breathing spaces (see below), spiritual and religious practices, and positive thinking. The self-care toolkit can help you identify signs and symptoms that you might be close to stress overload. Using it you explore helpful and unhelpful strategies for coping with stress, and consider a self-care plan that is realistic and achievable. It also has a self-care prompt to give you some ideas for what can go into your self-care plan. You can access the self care toolkit here. There is a growing body of evidence to suggest that when people intentionally practice being mindful they feel less stressed, anxious and depressed. Being mindful means paying attention to our thoughts, feelings, body sensations and the environment with an attitude of acceptance and non-judgement. With mindfulness, we bring awareness to our experience in each moment. By being present in this way, not forcing things, or hiding from them, but actually being with our experience just as it is, (pleasant or otherwise) we begin to see more clearly what is going on, and create space for new ways of responding to stressful experiences. As secondary stressors are largely unconscious, being mindful can help as it means we are more likely to recognise them as they are happening, and find alternative ways of responding to them. Better understand how we react to stressful situations. This in turn allows us to consider wiser and kinder choices about how to respond. For instance, being more accepting of the choices clients make in the moment, (as opposed to feeling frustrated or anxious), when we feel such choices are not in their best interest. Notice the way our thoughts influence emotional reactions and how strongly we feel them. For instance, noticing the thought that everything we do is ‘not good enough’ may lead to feeling insecure. If we believe this thought, over time it may lead to a chain reaction of stress, resulting in symptoms such as further self-judgement and anxiety (see these examples of stress reactivity). Better understand the way thoughts and feelings impact the body. For example, feeling butterflies in the stomach, or tightness in the chest or tension in the shoulders. Often it’s bodily sensations that bring our attention to what is going on in our mind, informing us that stress is happening. Recognize negative bias – we have a natural tendency to focus more on what’s negative or threatening than what is positive. When noticed, more attention can be given to remembering and savouring positive experiences from our day. Discover ways to see thoughts differently, and to challenge unhelpful ones. How would I have thought about this at another time, in another mood? Can I just observe these thoughts as thoughts, watching them come and go without feeling that I have to follow them? What are the costs and benefits of thinking in this way? As best you can, always adopt a kinder and gentler response to those thoughts you observe as self-judging.Treating ourselves with kindness, and ceasing to judge ourselves harshly are the cornerstones of finding peace and contentment in our lives. Is there something about this thought that I can question? Is my current mood influencing my interpretation of the situation? If so, in what way? Does this thought fit with the facts of the situation? Am I blaming myself for something that is not my fault, or others for something that is not theirs? Am I taking things on that do not relate to me personally? It is easy to be mindful when things are going to plan but it takes practice and confidence to remember to act mindfully in a crisis, when we feel some negativity or when something difficult, threatening or unpleasant happens. Creating spaces in the day to stop and observe what is going on in the present moment can be helpful in mitigating the negative effects of stress. STOP is one of many such practices to weave into your day. The aim of the practice is to enable you to pause and notice what is going on for you in that moment in time. This in turn helps you to consider alternative ways of responding, particularly if experiencing difficult thoughts, emotions, situations or events, (such as feeling angry, self-critical, or worrying about a client). It also helps to create a space to consider what to do next. (I.e. asking yourself ‘What do I need for myself right now?’, or ‘How can I best take care of myself?’). This self care prompt can help. Remember, everyone reacts differently to stress. Some people may not even feel warning signs until they’ve experienced hours or days of stressful activity. But as soon as you do, pay attention to the signs and listen to what your body is telling you. The breathing space can help. Click here for detailed instructions for the STOP breathing space. See tools and resources below for other formal and informal audio mindfulness practices to try out, and further information on mindfulness. There are even mindfulness based stress reduction courses you might like to consider, including an on-line course. The stress reactivity tool can help us understand more about how we personally arrive at our own emotionally charged reactions, such as feeling overwhelmed or overtired. It provides an opportunity to explore those reactions that create the most stress for us and consider alternative ways of responding to stressful situations and events. The worked examples will help you.